In order to make your convention experience and that of your fellow con-goers a pleasant one, we require everyone to observe the following rules. Persons violating this Code of Conduct may be asked to leave Yellow City Comic Con. Please have your Yellow City Comic Con event badge openly displayed on your person at all times while in any of the convention space(s). Yellow City Comic Con reserves the right to refuse entrance into events or service to any individual or group at any time. Harassment of any kind will not be tolerated. If you feel you are being harassed, please contact the Public Safety department or the nearest crew member. All individuals will be held to the standards of our Weapons Policy and Dress Code as published on this site. Fighting, combat, affray, mock combat, horseplay, fist fighting, martial arts sparring or demonstrations, or any other similar behavior will not be tolerated. Disorderly and disruptive behavior such as hollering, cursing around minors, noisemakers, Marco-polo, and disrupting foot traffic is prohibited and may result in ejection from Yellow City Comic Con. Persons committing theft, shoplifting, larceny, burglary, looting, robbery, counterfeiting and fraud will be ejected from Yellow City Comic Con and given to the custody of Amarillo City Police. Persons committing vandalism, graffiti, defacement, destruction of property, and criminal damage will be ejected from Yellow City Comic Con and given to the custody of Amarillo City Police. Panhandling, begging, soliciting, busking (street performing), or performing any act in exchange for goods, services, or money is prohibited.Signs worn or carried on the person are prohibited, except when verifiably part of a costume. Do not move any chairs or tables. If you are under 21, it is illegal to consume alcohol in the State of Texas. If you are over 21, be responsible if you consume alcohol: only drink in appropriate places, know when you’ve had too many, etc. Do not sleep in public spaces or function rooms. Put trash in trash receptacles only. Do not post flyers, posters, or promotional materials in public spaces or on walls; use designated tables and bulletin boards only. Turn off your cell phone while attending videos, panels, and events. Events, videos, and panels that Yellow City Comic Con deems to be of an adult nature require government issued photo identification indicating appropriate age (18+) to enter. 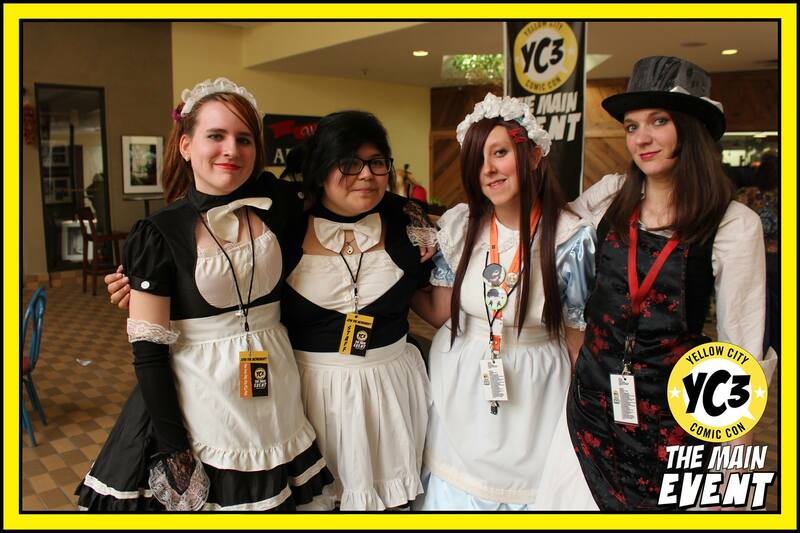 Yellow City Comic Con is committed to creating a safe and welcoming environment for all. As such, we ask you to remember that boundaries and comfort levels vary from person to person. Do not assume that a behavior you would find acceptable is therefore acceptable to another person. It is each individual’s responsibility to obtain definitive consent from another person for anything that involves that person. The absence of expressed consent must be treated as refusal. It is likewise every individual’s right to dictate their own boundaries and be respected. Yellow City Comic Con will not tolerate harassment, and reserves the right to revoke badge privileges and remove from the premises anyone found to be contributing to an unsafe or hostile convention environment. If you feel that you are unsafe or being harassed, please approach any member of staff for assistance in finding a convention operations team member. Your safety and comfort are a top priority. Badges and wristbands serve as proof of membership for the dates and/or times listed on them. Your membership grants you access to all non-specialty events and function spaces based on availability and convention policies. Specialty events (Yellow City Comic Con Ball, Maid Cafe, etc.) may require an additional fee. Badges and wristbands remain the property of Yellow City Comic Con LLC, and must be surrendered on request by an authorized representative of Yellow City Comic Con. Please remember that duplicating a membership badge is forgery- a felony in the state of Texas. If you are caught forging and/or selling forged badges, you will be banned from the convention, and given to the custody of the Amarillo City Police. The Yellow City Comic Con venue spaces comprise the Amarillo Civic Center. Access to these spaces requires that proof of membership be displayed at all times. No proof of membership is required to go to registration. Persons without proof of membership found to be loitering in any controlled spaces will be required to buy a membership or asked to leave.